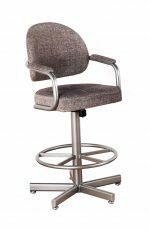 A tilt swivel stool does two functions: allows you to tilt or recline back and swivel 360-degrees. 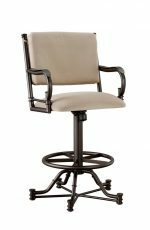 This functionality is only available on certain models that contain arms and have a balanced base, giving you the support you need when leaning back. 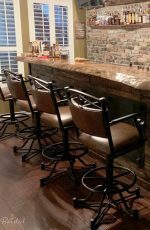 Why choose a reclining bar stool? One word: comfort. If comfort is important to you (and it should be! 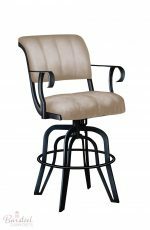 ), a reclining bar stool will topple the comfort notch than the average stool. 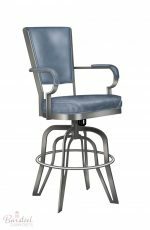 It’s a stool that’s built for long periods of sitting, whether you’re eating a Thanksgiving meal or mingling after dinner with friends, it’s a chair you’ll probably not want to get up from. And after a long hard day of work, that’s a good thing. It’s also a chair that can help prevent back pain. 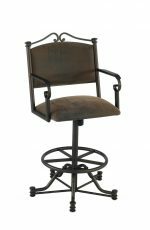 Ever sit in a stool and feel stiff after getting up? 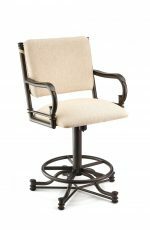 All of our reclining stools come with plush upholstery on the back, enhancing your sitting experience. Can double as an office chair. Modern kitchens today are creating office spaces in their kitchens or using islands as an office space. 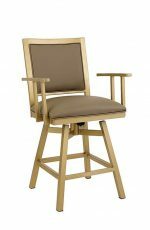 A reclining stool can work double-duty and act as an office chair during normal business hours and transform into the dinner chair at night. Enjoy a comfortable seat all day long! 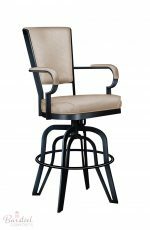 At Barstool Comforts, you can customize any of our stools to meet your lifestyle needs and interior design. Want a blue stool? No problem. How about Bronze? We can do that. 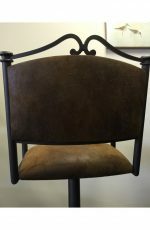 Our reclining stools come with a variety of fabrics, vinyls and even leathers to choose from! 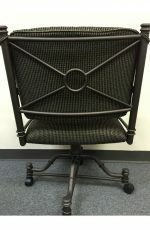 You can also customize these in your choice of metal finish color and seat height. 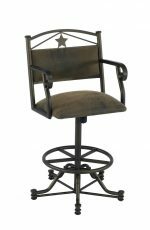 Most of these stools come in 24-inch, 26-inch, and 30-inch, while only a few come in 34-inch. All come with arms for safety reasons. 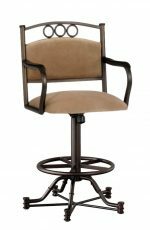 The tilt swivel mechanism has a vertical rotating shaft attached to the base or column of the stool. The upper part of the shaft has two mounting plates, connected by a hinge. 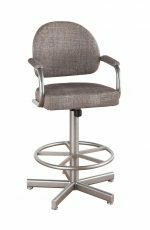 A normal swivel stool has just one mounting plate that can only spin. The seat is connected to the upper plate, and the hinge allows the seat to tilt backward. The rotating bottom plate allows the seat to spin while it tilts. 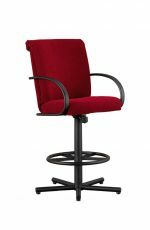 Rubber spacers cushion the seat as it tilts so the person on the stool always feels secure and in control. 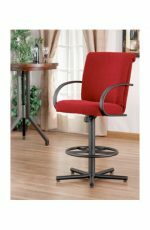 Tilt swivel seats are most popular on kitchen chairs because they are lower to the ground. 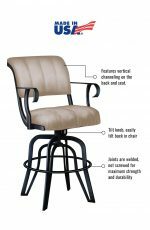 We don’t recommend tilt swivel seats on stools that are 30″ or higher, because the stool can become unstable if someone leans backward with too much force. 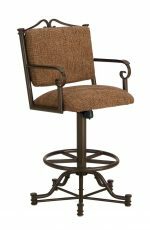 Tilt swivel stools usually have a post down the middle of the base instead of four legs. The post often has a ring footrest and four or five small legs protruding outward. 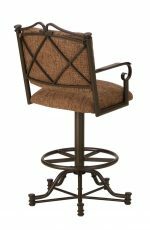 These smaller legs give extra stability to the stool. 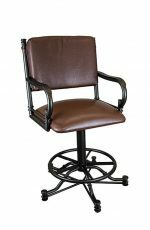 Reclining stools can be adjusted to your preferred degree of recline. Underneath the seat, you will find a thick knob. Tighten the knob to give the stool a smaller range of recline. Loosen the knob to expand the range of recline, which will let you lean back farther. If you tighten the knob until it stops, you will stop the recline. Need any help? We’re here! If you need help with your design or colors just email or call us. Or send us a photo of your room or kitchen and we’ll be happy to work with you on colors and style. We offer free expert advice to help you find the perfect stool!